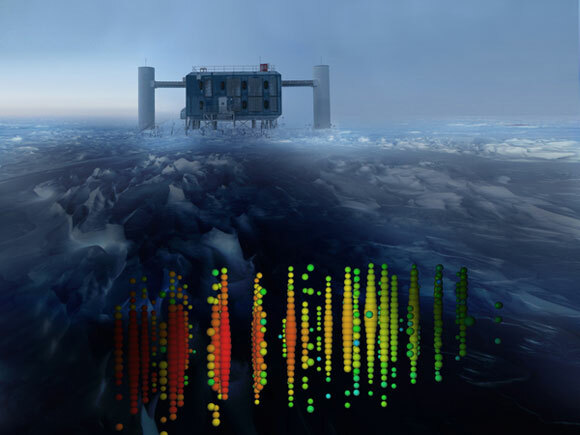 This photo illustration shows one of the highest-energy neutrino events of this study superimposed on a view of the IceCube Lab (ICL) at the South Pole. Evidence of the neutrinos heralds a new form of astronomy. Using data from the IceCube Neutrino Observatory, scientists have confirmed the existence of astrophysical neutrinos from our galaxy as well as cosmic neutrinos from sources outside the Milky Way. Researchers using the IceCube Neutrino Observatory have sorted through the billions of subatomic particles that zip through its frozen cubic-kilometer-sized detector each year to gather powerful new evidence in support of 2013 observations confirming the existence of cosmic neutrinos. The evidence is important because it heralds a new form of astronomy using neutrinos, the nearly massless high-energy particles generated in nature’s accelerators: black holes, massive exploding stars and the energetic cores of galaxies. In the new study, the detection of 21 ultra high-energy muons — secondary particles created on the very rare occasions when neutrinos interact with other particles — provides independent confirmation of astrophysical neutrinos from our galaxy as well as cosmic neutrinos from sources outside the Milky Way. The observations were reported in a paper published in the journal Physical Review Letters by the IceCube Collaboration, which called the data an “unequivocal signal” for astrophysical neutrinos, ultra high-energy particles that have traversed space unimpeded by stars, planets, galaxies, magnetic fields or clouds of interstellar dust — phenomena that, at very high energies, significantly attenuate more mundane particles like photons. Because they have almost no mass and no electric charge, neutrinos can be very hard to detect and are only observed indirectly when they collide with other particles to create muons, telltale secondary particles. What’s more, there are different kinds of neutrinos produced in different astrophysical processes. The IceCube Collaboration, a large international consortium headquartered at the University of Wisconsin-Madison, has taken on the huge challenge of sifting through a mass of observations to identify perhaps a few dozen of the highest-energy neutrinos that have traveled from sources in the Milky Way and beyond our galaxy. Those high-energy neutrinos, scientists believe, are created deep inside some of the universe’s most violent phenomena. The particles created in these events, including neutrinos and cosmic rays, are accelerated to energy levels that exceed the record-setting earthbound accelerators such as the Large Hadron Collider (LHC) by a factor of more than a million. They are prized by astrophysicists because the information they hold is pristine, unchanged as the particles travel millions of light years between their sources and Earth. The ability to study the highest-energy neutrinos promises insight into a host of problems in physics, including how nature builds powerful and efficient particle accelerators in the universe. The latest observations were made by pointing the Ice Cube Observatory — composed of thousands of optical sensors sunk deep beneath the Antarctic ice at the South Pole — through the Earth to observe the Northern Hemisphere sky. The Earth serves as a filter to help weed out a confusing background of muons created when cosmic rays crash into the Earth’s atmosphere. Between May 2010 and May 2012, IceCube recorded more than 35,000 neutrinos. However, only about 20 of those neutrino events were clocked at energy levels indicative of astrophysical or cosmic sources. The results are meaningful because, using the different technique, they reaffirm the IceCube Observatory’s ability to sample the ghostlike neutrinos. By instrumenting a cubic kilometer of deep Antarctic ice, scientists were able to make a detector big enough to capture the signature of the rare neutrino collision. When that rare smashup occurs, it creates a muon, which, in turn, leaves a trail of Cherenkov light that faithfully mirrors the trajectory of the neutrino. The “optical sonic booms” created when neutrinos smash into another particle are sensed by the optical sensors that make up the IceCube detector array and, in theory, can be used to point back to a source. But while the new observations confirm the existence of astrophysical neutrinos and the means to detect them using the IceCube Observatory, actual point sources of high-energy neutrinos remain to be identified. Albrecht Karle, a UW-Madison professor of physics and a senior author of the Physical Review Letters report, notes that while the neutrino-induced tracks recorded by the IceCube detector have a good pointing resolution, within less than a degree, the IceCube team has not observed a significant number of neutrinos emanating from any single source. The neutrinos observed in the latest search, however, have energy levels identical to those seen when the observatory sampled the sky of the Southern Hemisphere. That, says Karle, suggests that many of the potential sources of the highest-energy neutrinos are generated beyond the Milky Way. If there were a significant number of sources in our own galaxy, he notes, the IceCube detector would light up when observing the plane of our galaxy — the region where most neutrino-generating sources would likely be found. IceCube is based at the Wisconsin IceCube Particle Astrophysics Center (WIPAC) at UW-Madison. The observatory was built with major support from the National Science Foundation as well as support from partner funding agencies worldwide. More than 300 physicists and engineers from the United States, Germany, Sweden, Belgium, Switzerland, Japan, Canada, New Zealand, Australia, the United Kingdom, Korea and Denmark are involved in the project. Be the first to comment on "IceCube Collaboration Confirms Cosmic Neutrino Sighting"